Across Australia’s vast territory, wine, dairy products, wheat, barley, beef and mutton are produced under world-leading sustainable practices and stringent quarantine policies. The country’s low population density also ensures that these products are free from the bulk of agricultural pests, diseases and contaminants. 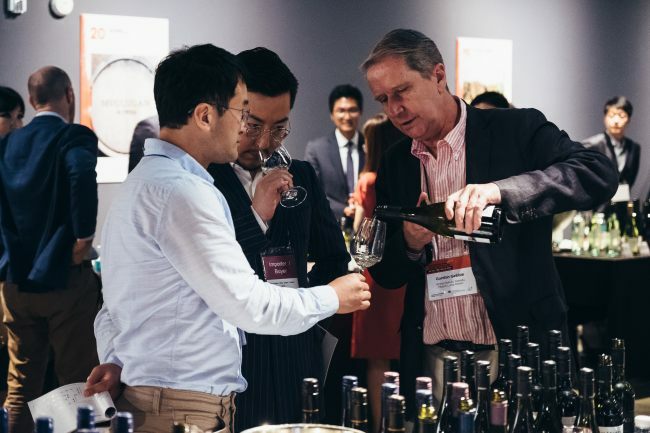 The nation’s popular wines were featured at the Australian Wine Grand Tasting 2018 event at Le Meridien Hotel in Seoul on Thursday. The annual event was hosted by the Australian Trade and Investment Commission in Korea (Austrade Korea) and Wine Australia. More than 270 wines from 32 exhibitors, including 12 wineries new to the market, showcased their products for Korean buyers and the media. A highlight of the event was a tasting seminar by Australian Master of Wine Ned Goodwin, who explained the nation’s contemporary wine varieties and drinking tips. 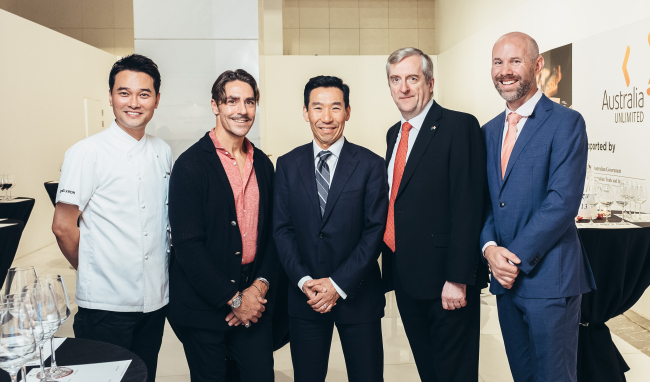 Edward Kwon, a Korean celebrity chef at Le Meridien restaurant Lab XXIV, presented dishes such as beef carpaccio with oyster mayo, Aussie meat pie, braised lamb shoulder and beef-lamb cutlet, which were served with different wines. In conjunction with the event, Austrade published Australian Food and Beverage Directory 2018, which provides in-depth information on wines and other alcoholic beverages, raw ingredients, meat and seafood, horticulture, vegetables, fruits, nuts, dairy products, honey, confections, health and food supplements and other retail products. Information on Australian-branded restaurants in Korea are also included. According to Amanda Hodges, a senior trade and investment commissioner at Austrade, the Australia-Korea free trade agreement removed tariffs and other barriers to bilateral trade when it entered into force Dec. 12, 2014, significantly boosting wine exports from Australia. The two countries recorded $35.5 billion in trade for 2016-17, she said. Australian wine exports to Korea increased nearly 25 percent in value from July 2017 through June 2018, according to Wine Australia, indicating growing consumer demand for premium brands. “Korean consumers have a sophisticated palate for food and beverages, including wine. The increase in Australian wine sales and the number of new entrants reflect Korean consumers’ demand for a wider range of Australian wines. It is also an outcome of the continuous promotional efforts made in Korea by the Australian and Korean wine industry since 2014,” said Hodges. Australia is the third-largest exporter of food and agricultural products to Korea, right behind the United States and China. As a major producer of livestock products, such as cattle, sheep, poultry and milk, as well as wheat and horticulture, Australia offers the highest-quality assurance standards in food and agribusiness production and processing, he said. The participating exhibitors, both currently exporting to Korea as well as those seeking to export from Australia, were Allied Young, BK Trading, Cave de Vin, Colico Co. Limited, Dongwon Wineplus, Enoteca Korea, HiteJinro, Kaja Wine & Spirits Trading, Keumyang International, LB Wine, Les Vins de Maeil, Muhak Liquor Trade, Mundovino, My Wines, Nara Cellar, Shindong Wine, VinoKims, Vital Wine, Winell, Y. Brothers Co., Angove Family Winemakers, Craneford Winery, Diva Australia, Great Australian Wine Co., Greenock Estate Wines, Hickinbotham, Hither & Yon, Kaesler Wines, Philip Shaw Wines, Shadowfax Winery, Voyager Estate, Yering Station, Mount Langi Ghiran and Xanadu Wines.